Spring is upon us this weekend as Easter arrives on Sunday, April 24. Church services and dinners are aplenty throughout the valley and so are Easter egg hunts. 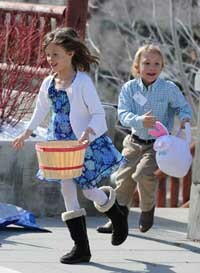 Sun Valley Resort will hold a Sun Valley Village Easter egg hunt with the Easter Bunny today, April 22, at 5 p.m. The hunt will take place around the Sun Valley Inn lake. An Easter Bonnet Candy Parade and face painting will take place at the Sun Valley Village Toy Store at 4 p.m.
On Saturday, April 23, The Mountain School in Bellevue will have an Enchanted Easter Adventure from 9:30 a.m. to 6:30 p.m. The event will start from 9:30 a.m. to 1:30 p.m. and continue from 2:30-6:30 p.m. Take part in a baby animal petting zoo, a Spring Fairy photo booth, nature crafting, puppet shows, stories, food and Easter egg hunt. The cost is $8 adults and $5 children. For details, call 720-0377. Also on Saturday, The Advocates' third annual Carbonate Hill Climb Race, Easter egg hunt and barbecue, sponsored by The Advocates and the Hailey Chamber of Commerce and supported by Big Brothers & Sisters, will take place at Hop Porter Park in Hailey. Bring a basket for the free community Easter egg hunt at 10 a.m. Race check-in and registration will take place from 10-10:45 a.m. The race starts at 11 a.m. A noon barbecue, which is $5, will include music and community organization booths. Race pre-registration is $10 per person, day of race is $20 and $25 per family at Sturtevants, The Elephant's Perch, Backwoods or www.theadvocatesorg.org. The Carbonate Hill Climb Race and festivities support The Advocates' education efforts surrounding  HYPERLINK "http://http:/www.nsvrc.org/saam/" o "Sexual Assault Awareness Month" Sexual Assault Awareness Month in April. For details, call 788-4191 or visit www.theadvocatesorg.org/Carbonate_Hill_Climb.php. Other Easter egg hunts on Saturday include the Teddy Bear Corner Preschool Easter egg hunt in Hailey at 11 a.m. For details, call 788-1955. The Valley of Peace Lutheran Church Easter egg hunt will take place Saturday in Hailey at 10 a.m. For details, call 788-3066. On Sunday, April 24, enjoy Easter brunch at the Sun Valley Resort with an expanded holiday buffet from 9 a.m. to 2 p.m. Adults receive a glass of champagne. Brunch for adults is $32.95 and kids under 12 are $24.95. For details, call 622-2800. Our Lady of the Snows Catholic Church Good Friday: Ecumenical Good Friday service 12:05 p.m. is a celebration with valley churches, Stations of the Cross 3 p.m., Good Friday service with the Veneration of the Cross 7 p.m. Sun Valley. Details: 622-3432. Emmanuel Episcopal Church Good Friday Liturgy: Hailey, 7 p.m. Details, 788-3547. Valley of Peace Lutheran Church Good Friday Worship: Valley of Peace Lutheran Church, Hailey, 7 p.m. Details, 788-3066. St. Thomas Episcopal Church Good Friday service: Episcopal Good Friday Liturgy, Sun Valley, 7:30 p.m. Details, 726-5349. Our Lady of the Snows Catholic Church Easter Saturday: Mass, 8:30 a.m. and Easter egg hunt for children at 10:30 a.m., Sun Valley. Details, 622-3432. St. Thomas Episcopal Church Easter Vigil and Reception: At this first Eucharist of Easter, the church will light the first fire of Easter, hear the great stories of salvation, celebrate Holy Baptism and receive Holy Communion. For the reception, bring goodies and beverages to share. Sun Valley, 7:30 p.m. Details, 726-5349. Emmanuel Episcopal Church Great Vigil of Easter, Service of Light, Word, Holy Baptism and first Holy Eucharist of Easter. Hailey, 8 p.m. Details, 788-3547. Our Lady of the Snows Catholic Church Holy Saturday: Easter vigil Mass, first Mass of Easter, Sun Valley, 8:30 p.m. Details, 622-3432. St. Thomas Episcopal Church Easter Day Services: Easter morning with a festive Holy Eucharist and glorious music, 8 a.m. Children are invited to bring fresh flowers for the traditional flowering of the cross at the 10 a.m. service. An Easter egg hunt takes place during the service. Sun Valley. Emmanuel Episcopal Church Easter Day: Holy Eucharist 8 a.m.; Easter brunch 9 a.m.; Holy Eucharist 10 a.m. with Easter brunch and egg hunt after service. Hailey. Details, 788-3547. Valley of Peace Lutheran Church Easter Worship: Hailey, 9 a.m. Details, 788-3066. Light on the Mountains Easter Service and Egg Hunt: A traditional Easter egg hunt will be offered for kids immediately following 9:30 a.m. service, Ketchum. Free. Details, 727-1631, www. lightonthemountains.com. Presbyterian Church of the Big Wood Easter Sunday: Two services, 9:30 and 11 a.m. Easter egg hunt follows 9:30 a.m. service, Ketchum. Details, 726-5123. Community Church Easter Service: Behind the Old Courthouse, Hailey, 11 a.m.